Last week whistleblowers told Spotlight that patients with broken legs, arms and other serious orthopaedic conditions are being sent home in the Free State because the buckling health system is simply unable to cope with the numbers. Now the Free State Department of Health has responded insisting that orthopaedic services and surgery in the province is not collapsing. The Department did however admit to a long waiting list at Pelonomi hospital. “The orthopaedic backlog for today stands at 72 hospitalised patients and 110 patients outside the hospital. On average 1 200 patients are admitted per month,” says Mondli Mvambi, Spokesperson and Head of Communications of the Free State Department of Health. The hospital does not send anybody home despite our lack of resources at times,” claims Mvambi. 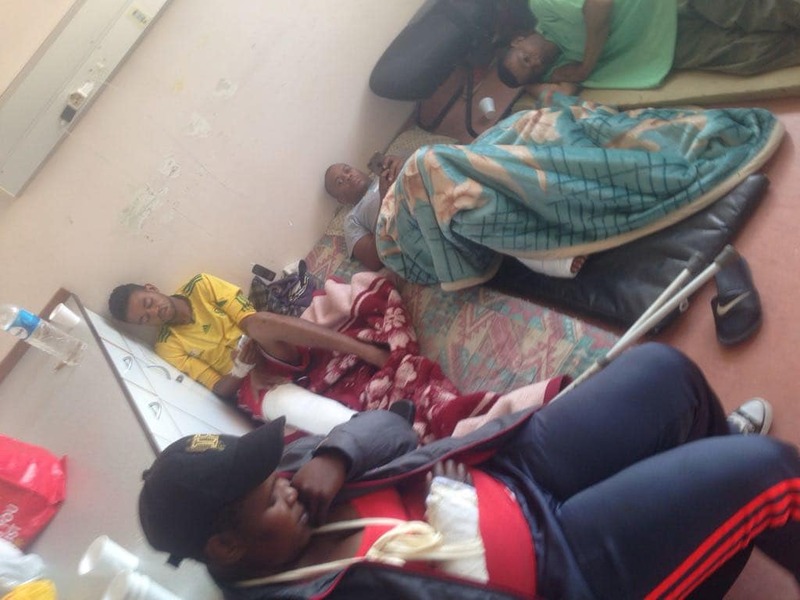 “Patients are being sent to Botshabelo hospital on Mondays to the orthopaedic clinic and Tuesdays for surgical interventions. There is currently less than seventy patients awaiting elective surgery at Pelonomi, emergency procedures are done on the emergency list on the day of admission or within a few days of admission. A healthcare worker whistleblower however told Spotlight that the Orthopaedic department does in fact send patients home without surgery. “On admission it was decided that they will undergo surgery. But due to the long waiting lists for emergency cases it is then decided to treat conservatively,” says the whistleblower, who also questioned how one could allow a waiting list of 70 people. The whistleblower also said that outreach activities are generally not nearly as good as claimed. Photographs sent to Spotlight this week show overcrowded waiting rooms in the hospital with patients sitting on chairs and lying on the floor. In addition to the long waiting list for orthopaedic procedures, Pelonomi appears to be facing a number of additional crises. “Cancer patients who need biopsies are put on a waiting list and reconstructive cases are warned that they may wait up to 5 years for their arthroplasty work,” a well-placed source told Spotlight. Our sources (who have asked not to be identified) claim that there is a general pattern of poor maintenance and of sub-standard equipment being acquired. This is potentially most harmful in theatre, where sub-standard operating tables and theatre lighting have allegedly been acquired and where new sub-standard and incomplete anaesthetic machines remain unused. That emergency activities at Pelonomi are of critical importance is not disputed by the Department. According to Mvambi there are seven specialists and eighteen doctors rotating between Universitas Academic Hospital and Pelonomi as the two function as a hospital complex. Previous PostPrevious Fifteen years without a wheelchair – who pays?